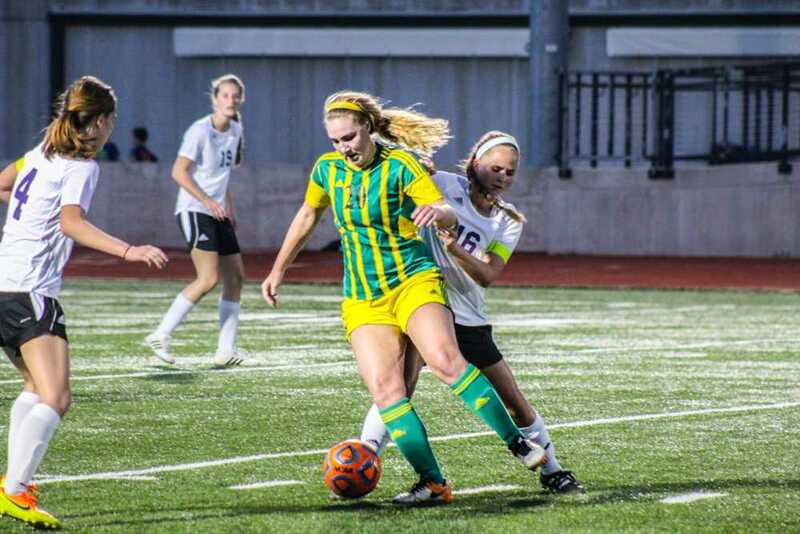 The girls’ soccer team competed in the St. Dominic Tourney April 24-27 in a three-game match-up against Fort Zumwalt West, St. Dominic and Parkway Central. In the first game of the tournament, RBHS and Fort Zumwalt West each attempted to get a step ahead of each other throughout the first half, but to no avail; both teams were scoreless at halftime. In the second half, however, the Lady Bruins took a 1-0 lead in the form of a goal by senior forward Molly Gunter in the 72nd minute. The Lady Bruins would eventually go on to win the game 1-0. Having started off strong, the Lady Bruins then faced St. Dominic in the second game of the tournament. The game was anticipated to be a tough battle, with both teams in a similar position in state rankings. St. Dominic, however, managed to keep RBHS scoreless throughout the entirety of the game, all while scoring a goal in each half to win the game 2-0. Despite the loss, junior forward Payton McCallister was optimistic nonetheless about the end result. “I think the game against St. Dominic was a well-fought game between two good teams, and although we didn’t win, we learned a lot that we will be able to use through the rest of the season,” McCallister said. The Lady Bruins hoped to redeem the loss against St. Dominic in the third and final game of the tournament against Parkway Central. Needless to say, the team certainly achieved this goal. The first half of the game saw an intense barrage of goals from McCallister, senior forward Molly Gunter, senior midfielder Paige Peterson and freshman midfielder Caroline Cole, which gave RBHS a tremendous 4-0 lead at halftime. The second half was no different, as two additional goals from McCallister and Klucking gave RBHS an even more insurmountable lead. The end result of the explosive performance was a 6-0 routing of Parkway Central and a rather satisfying win for RBHS. Despite the win, freshman midfielder Natalie Peng acknowledged that the team can improve in some areas, which they are working to get better at. “Each game we are improving with our finishing,” Peng said. The Lady Bruins hope to make such improvements in their play by the time they compete in their next game against Smith-Cotton May 1. That game will be the first of a stretch of two home games, in which RBHS will additionally face crosstown rival Hickman High School (HHS) May 3 in the two rivals’ annual May matchup.